Start by preheating your oven to 350 degrees. Take a baking dish (we used an 8- x 8-inch baking dish) and spray the inside of it with nonstick cooking spray. Leave the dish off to the side for now. Take a large mixing bowl out and mix the cream cheese, sour cream and enchilada sauce together until combined. 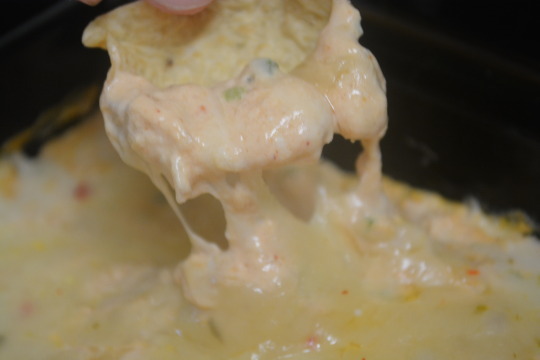 Now mix in the chicken, serranos and cheese, reserving some of the cheese* to use as a topping later. Take the bowl mixture and spread it out evenly in the baking dish, topping it with that cheese you set aside earlier. Put the dish in the oven and let the dip bake for 10 to 15 minutes or until the cheese looks golden brown. Serve the dip immediately, topping it with cilantro and the chips on the side. *We set aside ½ cup but it might be even better to set aside ¾ cup. 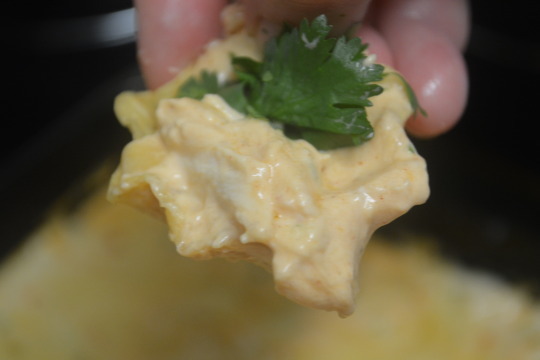 This is such a delicious cheesy dip ! We thought this was going to be really spicy between the serranos, enchilada sauce and pepper jack cheese but the dairy really tempers it down to a pleasant level of heat. While the cilantro is optional, we thought it brought a nice fresh component to the dish and the flavor from the cilantro pairs wonderfully with the dip. We got this recipe from Chile pepper magazine. We weren’t paid in any form to promote Chile pepper magazine.